OPINION: How could Martial Law happen? (Supporters of the Marcoses and President Rodrigo Duterte are – as usual - twisting what I said before the Filipino Staff Association of the World Bank Group-International Monetary Fund. I would like to thank the Filipino Staff Association of the World Bank Group and the International Monetary Fund for having me, especially its president Phil De Imus. 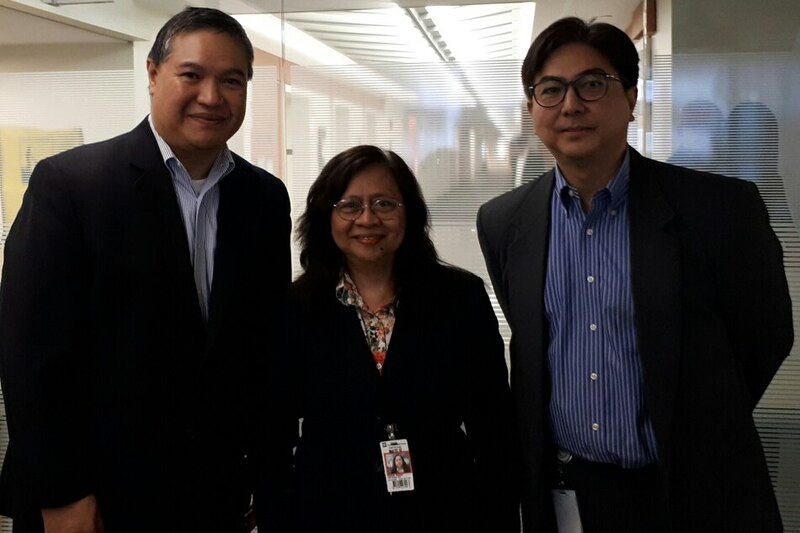 Raissa Robles (center) with Phil de Imus (left), president of the Filipino Staff Association of the World Bank Group-International Monetary Fund, and the association's Vice President, Gaio Gonzalez. 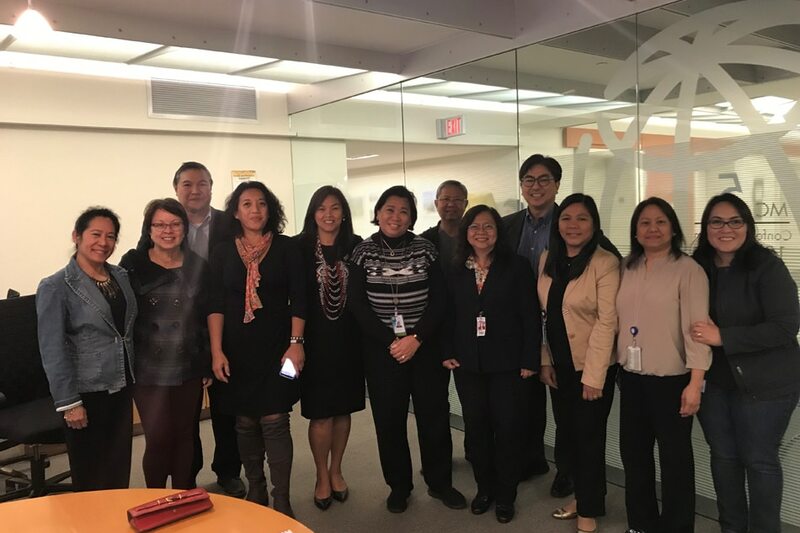 Raissa Robles with some members of the Filipino Staff Association of the World Bank Group-International Monetary Fund. While my cousin Gaio Gonzalez suggested me, I know you have a strict vetting process on who to invite to your forums. I am therefore very glad I passed your test. I would also like to thank Filipinos for a Better Philippines, my publisher for pursuing my book, as well as my husband Alan, who meticulously edited the book. As an investigative journalist, I have often used World Bank and International Monetary Fund reports as primary documents. The most useful parts for me have been the numerous tables and graphs scattered throughout each report, which the media have difficulty getting access to. I remember receiving leaked reports of both institutions when the Philippines transitioned from a dictatorship to a democracy. Those were very difficult days for many of us in the Philippines, so much so that even those who did not understand what the phrase “IMF prescriptions meant” learned to associate it with that horrible, horrible anti-stomach ache stuff from childhood called “paregoric”. When I did my research for my book “Marcos Martial Law: Never Again” I found out that the IMF gave Marcos an emergency loan shortly after he won his second and final term as president in 1969. In return, the IMF exacted from Marcos a painful antidote - the devaluation of the Philippine peso from 3.90 pesos per dollar in 1969 to six pesos in 1970. The steep drop in the peso’s worth created major social unrest and caused prices of goods to skyrocket. The rest of Marcos’ final four-year term as the country’s first reelectionist president was marred by student unrest. He would have ended his term by 1973 if he had not illegally imposed Martial Law in 1972. Military rule was initially good for the country in terms of economic indicators but not in terms of people’s rights. In 1976, just as the world first heard of the torture being committed by the military against political dissenters through a report by Amnesty International, Marcos scored another coup. The Board of Governors of the World Bank and the International Monetary Fund agreed to hold its annual meeting in Manila in 1976. I recall, for that meeting, the brightest students in Manila’s schools were asked to serve as usherettes. By so doing, the Fund gave Marcos’ brand of constitutional dictatorship its stamp of approval. Manila didn’t have enough hotels to hold the delegates. No problem. A US$500 million loan with government guarantee was extended to the Marcos government and Imelda rushed the construction of 18 luxury hotels, which later turned out to be owned by the Marcoses through certain dummies. Let me just say that the WB, the IMF and the Marcoses were cozy companions. However, the following year, 1977, an urban poor leader from Manila’s poorest district Tondo was arrested by soldiers and brutally tortured. She was electrocuted using a US-made military field telephone. The wires were initially wound around both her thumbs. In 2012, Herrera by then 71 years old, narrated her ordeal to local TV5 station. She said the four men in the room - her interrogators - stripped her naked and made her stand barefoot on the ground, on which they poured water to magnify the electric shock. So whenever the crank of the field telephone turned, she said, the current shot through her body. “I kept screaming and screaming even though no one would be coming to my rescue,” she said. In 2015, one of her accused torturers, Col. Eduardo Matillano, allowed me to interview him. He could not recall the name of the torture victim who was the reason for his court martial. But he emphasized that she was a "subversive”. Later, Col. Matillano opened up to me why torture was happening. He replied, “When I want to get information first - who are your companions, where are they, how do you conduct your activities. “That’s our method of forcing him to talk, because it’s easier,” he told me. Trinidad Herrera would have rotted in jail indefinitely like over 50,000 detainees, if not for the timely intervention of the US Embassy, prodded to action by no less than the American First Lady then, Rosalynn Carter. And, for the support of American church officials as well as an unlikely ally - the World Bank, which was familiar with Herrera's organization. 4) the economic implications of another Martial Law. Because I would like to emphasize that behind the graphs and statistics of multilateral institutions like the World Bank and the IMF are millions of human lives affected by loan agreements, by borrowings that grow sour, and by the collapse of an economy kept alive by a transfusion of emergency loans. Today, the Philippines is being confronted once again by a choice - whether to go forward as a democracy or as a one-man rule. In my most recent talk, someone asked me what I thought of President Rodrigo Duterte setting up a revolutionary government since the 16 million people who voted for him already agreed to support him on this. First of all, I answered, please do the math. Of 54 million registered voters, Duterte was voted into office by only a third. Insofar as the presidential elections were concerned, 16 million was enough to get him elected president since it’s winner take all. However, the Philippine Constitution is quite clear - that in order to change the form of government, the proposed changes have to be approved by a simple majority of votes cast. This means, for instance, if 81% of the 54 million voters cast their votes, the changes need at least 21,870,001 votes. In short, the government needs 5 million more votes on top of the 16 million who already voted for Duterte. Before I go on, let me clarify what I mean by Martial Law and revolutionary government. Martial Law was merely the means for President Ferdinand Marcos to set up his own revolutionary government. By proclaiming Martial Law, Marcos was able to call out the military to illegally shut down the media, the Congress, and arrest 60,000 people in the first weeks alone. I maintain that what Marcos did was patently illegal. Yes, he had the power as Commander-in-Chief to call out the army to quell rebellion - although he himself told the US Ambassador there was no sufficient basis. But no, he did not have the power to use Martial Law in order to reform society. That was not written in the constitution. “Reform society” happens to be what President Rodrigo Duterte claims said he wants to do as president. Duterte had the power to call out the army to suppress lawless violence in Marawi City. However, he does not have the power to use martial law to institute political reforms, which is what his close allies are urging him to do. Martial law is a power intended only for extreme emergencies. It is like the electric shock administered on a patient whose heart has momentarily stopped beating. It is not meant to be a constant thing or the new normal, which is what Marcos made it from 1972 to 1986. Marcos was a dictator who ruled as he pleased by decree. Anytime he felt like doing something, he ordered it, writing out the law as he pleased. There was no check or balance on his power. Because of what Marcos did, the 1987 Constitution that was approved a year after Marcos fled, placed safeguards to prevent a repeat of Marcos’ Martial Law. However, a revolutionary government can be put in place by Duterte even without declaring Martial Law. All he needs to do is get Congress to back him up and approve a resolution by three-fourths vote to put up a revolutionary government. At this time, I believe the President can easily gather 3/4 of the vote in the House of Representatives. I am not sure, though, if he has 3/4 or 18 votes in the Senate. The vote of the senators is not necessarily a sure thing. Why? Because one of the proposed amendments they would be supporting if they voted yes, would be the destruction of the Senate. One of the proposed amendments is to have a unicameral assembly. This would mean abolishing the Senate and cutting short the terms of office of the 12 senators who were voted in 2016. The final step to setting up a revolutionary government is to have the changes approved in a plebiscite. The Philippines has never conducted a plebiscite to approve changes in the Constitution. It is Congress that will define by law how a plebiscite will be conducted. Congress could even decide that, like the Citizens Assemblies that approved the Marcos Constitution, approval will be by viva voce. Meaning, the crowd will merely be asked to shout out “aye” or “nay” and whichever side shouts loudest will win. I believe, however, that the plebiscite will be added as a “rider” to the coming polls to elect barangay officials by next year. The best time that President Duterte could act is by next year, since mid-term elections are in 2019 and the political wind might suddenly change. There are indications that the ruling party is hurrying to do just that. House Speaker Pantaleon Alvarez has announced that constitutional change is on top of his legislative agenda. President Rodrigo Duterte has made reassuring noises that even if he declares a revolutionary government, he does not intend to stay on for long. That he would step down as soon as it is put in place. Probably not, because he keeps changing his mind. He promised a drug war that would last only for six months. Now he is saying it will last his entire term. He promised to ease Manila traffic. Now it is worse. He promised businessmen that only five signatures would be needed to start a business. That hasn’t happened. Yes, he has delivered on some promises. Such as extending the passport validity and drivers’ license. Now what are the signs that President Duterte is bent on setting up a revolutionary government, and/or declare martial law? I see eight of them. Number one, no other president since Marcos has ever talked so much about the need to declare Martial Law or the desire to establish a dictatorship. He just keeps talking and talking about it. Is he joking? I doubt it. Number two, no Philippine president since Marcos ever declared a state of emergency nationwide after just one bombing. Which is why Martial Law veterans suspect this is but a prelude to Martial Law. Number three, Ferdinand Marcos resorted to “Citizens’ Assemblies” to ratify the charter which legalized his dictatorship. Even as I speak to you today, the Duterte government is frantically organizing at the grassroots level a group called “Kilusang Pagbabago” or Movement for Change. It will, among others, push for a federal type of government. Doesn’t the name remind you of Marcos’ Kilusan ng Bagong Lipunan or Movement for a New Society? Number four, like Marcos, Duterte promised to increase police and military pay. Number five, one of the first things that Marcos did in preparation for declaring martial law was to expand the size of the military, especially those units directly under his most faithful general Fabian Ver. Duterte, for his part, told Reuters news service before the May 2016 elections that he would form two new army divisions to tackle security threats. That’s around 8,000 men. If he does that, this would in effect constitute a strike force, an army within an army, which was basically what Marcos had with General Ver. Number seven, Duterte threatened to “smash” Congress if the lawmakers opposed his fight against crime. Marcos did smash Congress in 1972. Also, Duterte said that if Senate tried to impeach him over allegations of hidden wealth, he would shut down Congress. Before Marcos had imposed martial Law, calls were mounting to have Marcos investigated for his hidden wealth abroad. Number eight, Duterte has more or less gotten the acquiescence of the Supreme Court in all his key moves. The high court endorsed his reasons for declaring martial law in Mindanao, although on the face of it, the conditions specified by the constitution were not met. It has endorsed his arrest and jailing of his political enemy, Senator Leila de Lima. You will probably ask - how can Duterte do it when he promised a parliamentary-federal type of government? Actually, he also promised a revolutionary government. But in any case, there is nothing to prevent him from breaking promises. Philippine history shows that on the two occasions that the country switched from one form of government to another, the political institution underwent a transition period. It was this transition period that Marcos exploited to entrench himself in power. During his time, the country never actually transitioned from the presidential to the parliamentary form of government. Marcos caused to be embedded in the 1973 Constitution a section on “Transitory Provisions”. This section legitimized Marcos’ decree or law making powers even while the National Assembly was in session. Not only that, Marcos could even assign other entities to draft the laws which he would then sign. Among those entities that was actually writing laws during Martial Law was the Philippine Constabulary. There are calls now for Duterte to head the transition period when the form of government shifts from presidential to parliamentary-federal. I can tell you with confidence that whoever heads the transition government can do anything. And I mean anything. For instance, Marcos got the Constitutional Convention delegates - which by the way included somebody named Richard Gordon - to campaign for the ratification of the 1973 Constitution. In exchange, the delegates would automatically get a seat in the planned National Assembly. Marcos fooled them all. He never convened the National Assembly. Instead, he wrote a decree or law creating the Interim Batasang Pambansa or IBP and convening this five years later in 1978. Since it wasn’t the same banana as the National Assembly, Marcos did not have to fulfill his promise to the Constitutional Convention delegates, which by the way also included the late President Diosdado Macapagal. A somewhat similar betrayal took place during the post-1986 people power after President Corazon Aquino replaced Marcos. She had promised the post of Prime Minister to Salvador Laurel, her running mate at that time. Laurel enjoyed the post only for a month because on March 25, 1986, Mrs Aquino issued Proclamation No. 3 putting in place a “Provisional Constitution”, better known as the Freedom Constitution. It abolished the post of Prime Minister who was in charge of running the government day-to-day. Ms. Aquino replaced the post with the Vice President, a mere spare tire. We can see that a transition period could give the person at the very top awesome powers that could be used to establish authoritarian rule or a democracy. Duterte has shown a marked inclination toward authoritarian rule. Finally, let’s consider the question - would a revolutionary government be good for the economy and the people? The World Bank actually has part of the answer to that. A link to the website page called Stolen Asset Recovery Initiative shows a summary of the ill-gotten wealth cases of the Marcoses. The page is co-sponsored by the UN Office of Drugs and Crime. The problem with strongman rule is that the strongman does not want to be criticized and made accountable. During Marcos’ time, that led to unprecedented corruption which eventually sank the economy and brought on misery and poverty. Marcos used his power for himself, his family and his cronies. They siphoned billions of dollars for themselves and stashed much of it abroad. In closing, I would like to emphasize that one thing that the Marcos period should have taught us is that without the checks and balances of other institutions like Congress, the Judiciary and the free press, a dictator is free to define who a criminal is, who can be arrested and who can be put to death. When all the institutions of democracy are destroyed or suppressed, or bought, then it is down to the citizenry, to the public, to make a choice. Live with the dictatorship or resist. It is not an easy choice.